The effects of elapsed time following gas metal arc welding (GMAW) on the static strength of lap fillet-welded joints were investigated using a static tensile test. It was observed that the static joint strength did not exhibit a time dependency for cases where the fracture was located in each base metal or the softened heat affected zone (HAZ). In addition, the static joint strength was not observed to have a time dependency for cases where a wire with low-hardness weld metal was used and where the fracture was located in the weld metal. However, the static joint strength was low immediately after welding, and increased over time when a wire with high-hardness weld metal was used. It was found that diffusible hydrogen that entered the weld metal during arc welding and was emitted over time was the cause of the time dependency of joint strength. 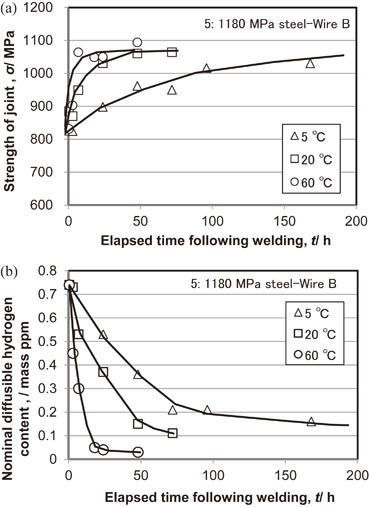 High-hardness weld metal was sensitive to diffusible hydrogen; therefore, time dependency was observed only when wires with high-hardness weld metal were used and the fracture positions were located in the weld metal during tensile tests. In addition, a correlation between the storage temperature following welding and the static strength or diffusible hydrogen content of welded parts was found: the higher the storage temperature, the earlier the joint strength increases, and the earlier the diffusible hydrogen decreases.